Got a full house for the holidays? Lucky you! The holidays are one of our favorite times of the year because friends and family come together to enjoy each other’s company and a delicious feast while creating special memories that will last a lifetime. Delicious on holiday turkey or ham or on a turkey sandwich made from Thanksgiving leftovers. In a medium sized heavy saucepan, cook shallots in olive oil over moderate heat, stirring occasionally, until softened. 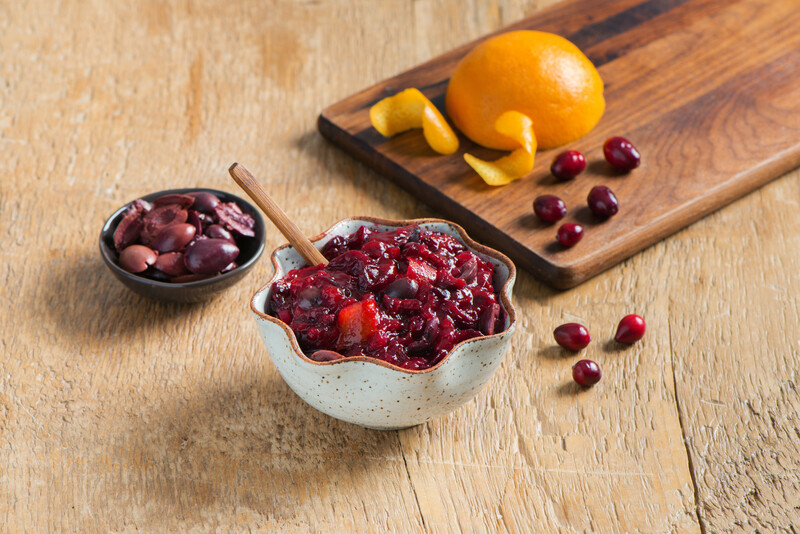 Stir in cranberries, orange zest and juice, sugar and vinegar. Simmer, stirring occasionally, until berries just pop, 10 to 12 minutes, then add olives, black pepper, stir and serve. 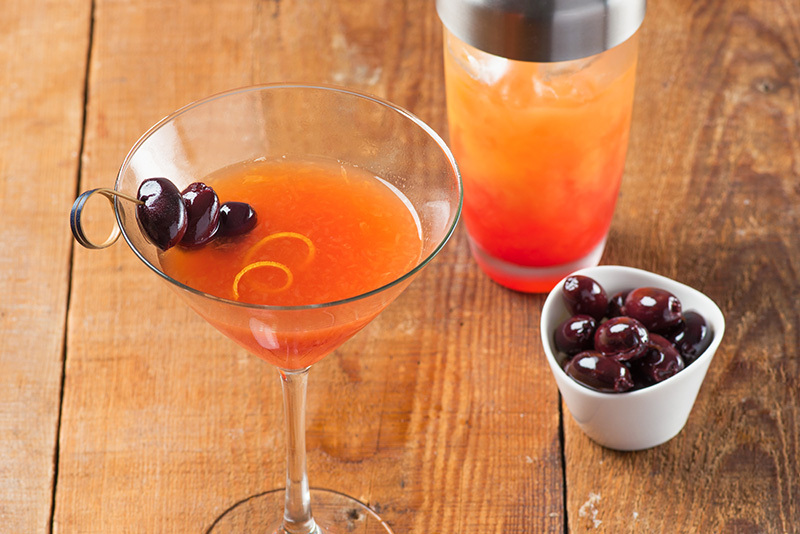 Add vodka, triple sec and orange juice to a cocktail shaker with ice. Shake well and strain into a chilled martini glass. Garnish with a few kalamata olives and an orange peel. Chef’s note: If blood orange vodka is unavailable in your local grocery store, you can substitute for citron flavored or regular orange vodka. In a medium-sized bowl, add the ricotta cheese, parsley, and garlic. Combine well. Season with salt and pepper. Gently mix in the tomatoes and olives, until just incorporated. Spread the ricotta mixture in a shallow medium baking dish in a 3/4″ thick layer. Bake about 12 minutes or until slightly browned along the edges and hot. Remove from the oven and let rest for a few minutes. Serve warm. Season squash with salt and pepper and drizzle with olive oil. Lay on a sheet pan, open side face down and bake about 20 minutes or until squash is fork tender and edges are nicely golden. Remove from oven and set aside. To prepare the filling, combine the couscous, sausage, sun-ripened tomatoes, roasted peppers and stir together. Place a generous amount of the mixture into each squash, lightly pressing the filling in. 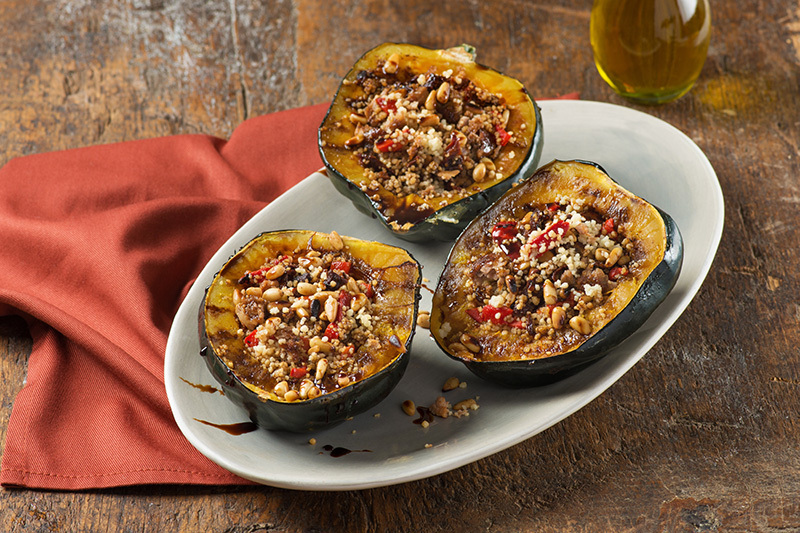 Sprinkle with pine nuts, and finish with a drizzle of olive oil and balsamic glaze. Serve hot. Brush both sides of sliced bread with olive oil and place onto baking sheet. Bake for about 7 minutes or until toasted and crispy. Remove from oven and set aside. In a small bowl, combine the ricotta and rosemary. Season with a little salt and freshly cracked pepper and set aside. 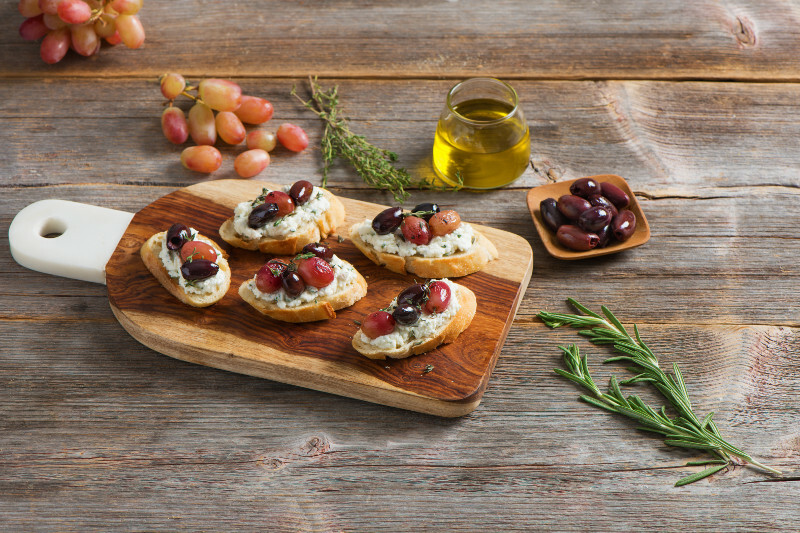 On another backing sheet, add the grapes and olives, drizzle with a tablespoon of olive oil and toss to coat evenly. Roast in the oven in 5 minute intervals for about 15-20 minutes. Each 5 minutes, shake the pan to get even roasting. 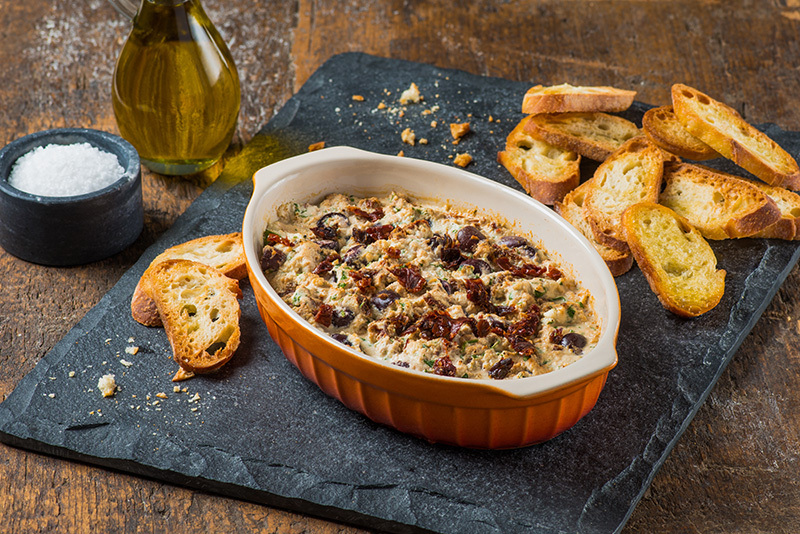 Remove from oven once olives are slightly blistered and grapes begin to get soft and juicy. Let set for about 5 minutes, and once cool enough to handle, cut grapes and olives in half. On each crostini, add about a tablespoon of ricotta and spread evenly. Add a spoonful of olives and grapes to each and top with a sprinkle of fresh thyme, drizzle of olive oil, and a light sprinkle of freshly cracked black pepper. Serve immediately.